Philippines Monday said one Filipina house worker has been admitted to hospital in the Saudi southwestern city of Jizan after her employer allegedly forced her to drink bleach. Philippines foreign ministry identified the house worker as Agnes Mancilla. She was whisked unconscious to hospital where she underwent emergency abdominal surgery, the ministry added. “We are working closely with authorities in Jizan to make sure that justice will be given to Agnes Mancilla,” it added in a statement. Her employer, a Saudi woman, was arrested by police. Her identity has not been disclosed. Mancilla is in stable condition though still seriously affected the statement added. The Filipina citizen has been working in the kingdom since 2016 and has faced abuses from her lady employer who was only known for refusing to pay Mancilla’s salary, according to Edgar Badajos, the Filipino consul in the Saudi city of Jeddah. There are hundreds of thousands of Filipinas working across the Middle East. In January Manilla slammed the Arab host countries and Kuwait in particular for abusing Philippines citizens working there as maids. 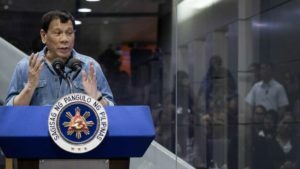 President Rodrigo Duterte in February issued a ban on the deployment of the Filipinas to the Arab countries, sent charter flights to Kuwait to fly out several thousands of its people living in the Gulf country. The two countries further fell out after a 29-year old Filipina worker was found stuffed in a freezer in an abandoned apartment. She had apparently been in the freezer for over one year. Written by: KanelkaTagba on April 17, 2018. Posted by KanelkaTagba on Apr 17 2018. Filed under Gulf News, Headlines. You can follow any responses to this entry through the RSS 2.0. Both comments and pings are currently closed.